Can you put a name to her photo, here? 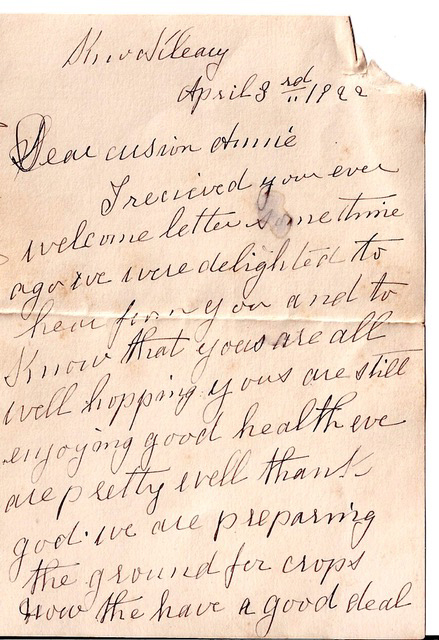 I was given these letters by a newly-discovered cousin in 2012. 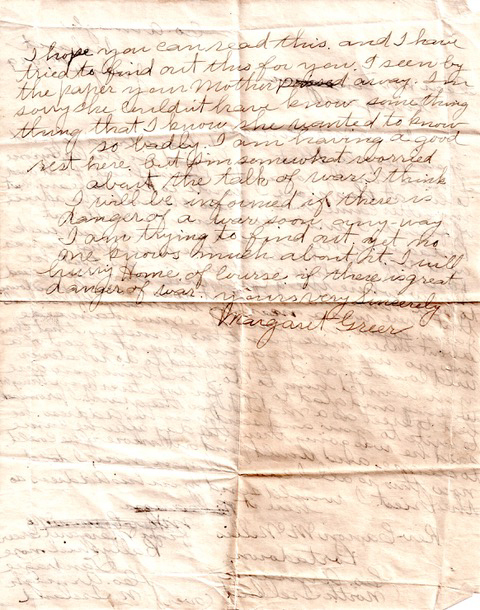 After many years of fruitless research, and two trips to Co. Tyrone, the letters proved key to the confirmation that my LAGAN ancestors were indeed those of Knockaleery townland, parish Kildress. 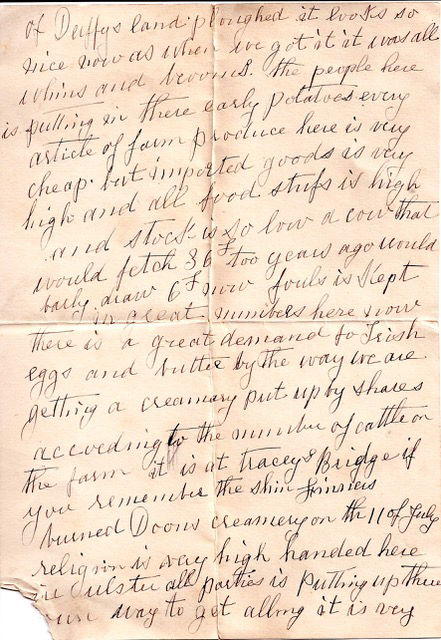 The Finigan family farmed in Lancaster County, Nebraska, on land adjacent to that of my 2X great-grandmother, Sarah Lagan (1827-1908) and her husband, John R. Taylor. I had long considered the Finigans to have been simply neighbors to the Taylors. It took a several-year hiatus from my research, and a return to the task with a fresh eye, to allow me to recognize that they were family. 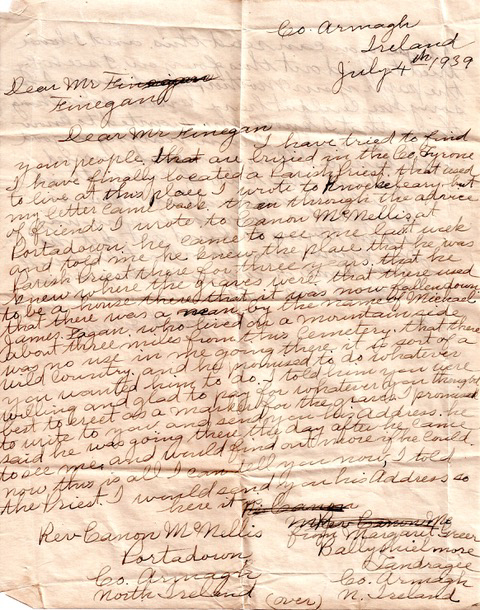 1939 letter from Margaret Greer of Co. Armagh to James S. Finigan (son of Annie above) in Nebraska, RE her search for the whereabouts of the grave of Michael James Lagan of Knockaleery, Kildress"
Penciled note in another hand on the front of the envelope, presumably written by the addressee, James Finigan: "ans. 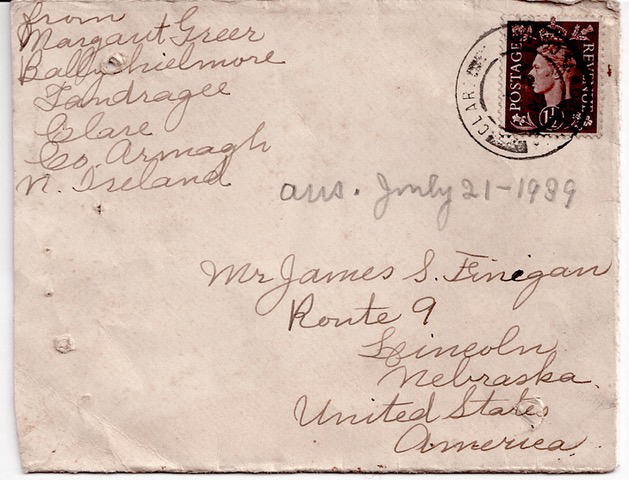 [answered] July 21-1939". I hope you can read this and I have tried to find out this for you. I seen by the paper your mother passed away. I'm sorry she couldn't have know[n] something that I know she wanted to know so badly. I am having a good rest here, but I'm somewhat worried about the talk of war. I think I will be informed if there is danger of a war soon. Any-way I am trying to find out yet no one knows much about it. I will hurry Home of course if there is great danger of war. The Courier, Prairie du Chien, Wisconsin, June 24, 1913, page 4. Obituary -- Patrick Lagen. Died at his home on Michigan street, Sunday, June 14, 1913. 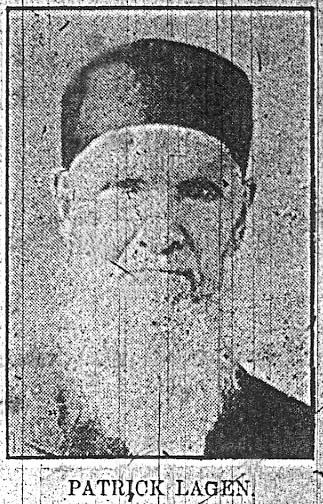 Mr. Patrick Lagen, aged 97 years, 3 mos., and 7 days ... was born March 7, 1816, near Cookstown in the county of Tyrone, Ireland, and grew to manhood in the land of shamrocks, and at the age of twenty-four (24) he crossed the sea landing in New York in the year 1840. He saw opportunities opened before him in the mercantile trade and under the firm name of Crown & Lagen, he established himself at 17 Anthony Street in the fifth (5th) ward opening and conducting a general store. 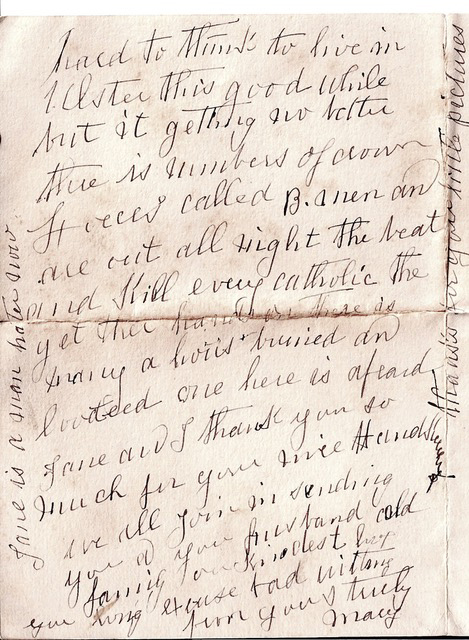 In the year of 1849 he was united in marriage to Miss Catherine Toner an old schoolmate and in the spring of that year he with his young bride decided to seek their fortune in the west, came to Wisconsin, first settling in Elba, Dodge county on a farm. After seven (7) years as a resident of Dodge county, he moved to Crawford county in 1856 and settled in Mt. 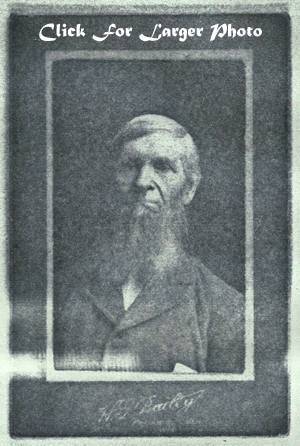 Sterling becoming the owner of a fine 400-acre farm and devoted the active years of his later life to raising stock and conducting one of the best farms in that vicinity. . in 1877 at the age of 61 years he moved to the city of Prairie du Chien with his wife and two daughters, Millie and Mary, purchasing the present home on Michigan street where he spent many years in comfort. . During his residence upon American soil, his heart was ever cherishing the hope that he might live to see the land of his birth, free from the toils of the British, and that "Home Rule for Ireland" would dawn in his time. He made six  trips to the land of shamrocks and on one trip was six  weeks on the ocean, and during the great famine in Ireland he sat foot upon the soil to relieve the distress of relatives and friends. ..